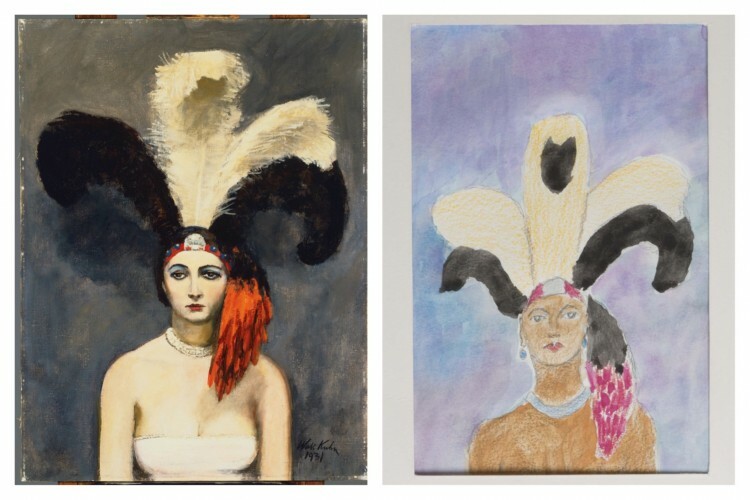 I intended to follow up on our post about Plumes (1931) with another about Walt Kuhn’s works of women wearing tall hats and headdresses, of which there are quite a few. But as I started reading more about his life, I found that there is so much else to talk about when we talk about Walt Kuhn. Not only was he a chief organizer and chronicler of the 1913 Armory Show, and a spirited illustrator (as evidenced in his Christmas cards), but, perhaps not surprisingly, he tried to make a go at a theater career. A boyhood job delivering costumes backstage sparked his interest in the theatrical world, and in the 1910s and early ’20s, he was known for his flair with productions. Kuhn produced dramatic parties and masquerade balls for artists’ organizations such as the Kit Kat Club and the Penguin Club, as well as staged one-act plays with the likes of Robert Benchley and Dorothy Parker. He even designed scenes for early stage pieces of Busby Berkeley. In 1923, disheartened by the low (and sometimes non-existent), pay of his theatrical efforts, Kuhn turned his full attention to painting. For me, a fan of train travel, one of the most interesting branches of Kuhn’s creative career was his design for two Union Pacific Streamliner rail cars. “Little Nugget” was a first class club car designed for a passenger train called “City of Los Angeles”. The interior was meant to evoke an Old West-style saloon with rococo flourishes and also included many of Kuhn’s images of vaudeville clowns and performers. The “Frontier Shack” lounge car for the “City of Denver” train embodied a very different, but equally American, style of the frontier cabin; a woodsy setting replete with wanted posters and hanging lanterns. To learn more about Walt Kuhn and see digitized archival materials related to the projects described above, see the Archives of American Art’s rich holdings on this artist. Walt Kuhn, Plumes, 1931, Oil on canvas 40 x 30 in. ; 101.6 x 76.2 cm.. Acquired 1932. The Phillips Collection, Washington DC. That passage is from Phillips’s 1932 catalog to accompany an exhibition at the museum, Kuhn’s first solo show in Washington. Phillips purchased six Kuhn paintings between 1924 and 1943. This work is on view in the Made in the USA exhibition through August 31, 2014.